Case Presentation: A 66-year-old woman with a history of hypertension and type 2 diabetes mellitus presented to an outside hospital with persistent nausea and vomiting, a 45 pound weight loss, and dysphagia over a 4-week period. In addition to the new diagnosis of atrial fibrillation, esophagogastroduodenoscopy identified a lesion in the gastric cardia concerning for malignancy. Biopsies of the lesion demonstrated necrotic tissue, resulting in transfer to our tertiary referral center for further diagnostic evaluation. Upon repeat endoscopic visualization and biopsy, there was evidence of ischemia and ulceration throughout the gastric body and antrum not consistent with Helicobacter pylori infection or anti-inflammatory medication use. Computed tomographic angiography of the abdomen revealed a large calcified aortic mass causing complete occlusion of the celiac and superior mesenteric arteries. The patient underwent surgical revascularization with resolution of her symptoms. Notably, the patient never experienced post-prandial pain. Discussion: Gastric ischemia is a rare diagnosis due to the stomach’s extensive collateral blood supply. 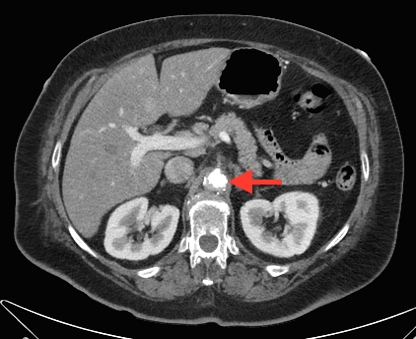 As seen here, the presence of an intra-aortic celiac and superior mesenteric artery obstruction wholly compromised the stomach’s arterial supply. There is capacity for inferior mesenteric to superior mesenteric artery collateralization through the artery of Drumond that was appreciated on this patient’s imaging. However, in these cases the gastric antrum represents the most distal area of flow. Presumably, this patient’s symptoms arose from the combination of aortic plaque progression and atrial fibrillation induced splanchnic hypo-perfusion. Calcified abdominal aortic plaques are most commonly intimal and associated with atherosclerotic disease. The mechanism by which these plaques form is not fully understood but numerous risk factors have been identified including advanced age, diabetes, hypertension, and smoking history. Our patient carried all of these risk factors. Conclusions: Gastric ischemia is an uncommon and difficult disease process to identify, particularly in the absence of post-prandial pain. Nevertheless the diagnosis should be considered in the setting of biopsy unrevealing for malignancy, H. pylori-negative ulceration, and a lack of nonsteroidal anti-inflammatory drug use. Martin E, Boulos P. Dysphagia, Weight Loss, and a “Mass.” Foregut Vascular Insufficiency Masquerading As Gastric Cancer. Abstract published at Hospital Medicine 2016, March 6-9, San Diego, Calif. Abstract 666. Journal of Hospital Medicine. 2016; 11 (suppl 1). https://www.shmabstracts.com/abstract/dysphagia-weight-loss-and-a-mass-foregut-vascular-insufficiency-masquerading-as-gastric-cancer/. Accessed April 25, 2019.